Between 2013 and 2015 five senior artists from Ngurratjuta Iltja Ntjarra (Many Hands) Art Centre in Alice Springs died. Fellow Hermannsburg artist, Gloria Pannka, says, "It's a loss which is felt both physically and culturally; our generation is fragile and unfortunately, we are losing a lot of our family. I am concerned about the tradition being lost and we are trying to encourage the younger generation to be strong and carry on the landscape tradition. When we go out on country trips we think about these men, how we used to go out together and we have fond memories. We will cherish those memories through our lifetime together." Johannes Katakarinja died suddenly in Alice Springs and was buried at Hermannsburg in May 2013. He was 56. Born at Hermannsburg in 1956. The name Katakarinja is the Aboriginal name for Mt Zeil which often appears in Johanne’s works. From the age of 13, Johannes learnt to paint in the watercolour style of his grandfathers and uncles. His mentor was his grandfather, Walter Ebatarinja. As a teenager, Johannes would skip school to head out to Palm Valley with his grandfather to paint. Regarded as a talented watercolour artist Johannes Katakarinja carried on the tradition of the Hermannsburg School of Watercolour Artists with many of his works appearing in group exhibitions around the country. His career also involved various commissions, including painting the mural at the Hermannsburg Finke River Mission Store. Johannes Katakarinja began painting with Ngurratjuta Art Centre in 2010 (which also holds his last unfinished work). A posthumous solo exhibition was staged at the Paul Johnstone Gallery in Darwin. Albert Namatjira Jnr died after a short illness in Adelaide aged 64. He was buried at Hermannsburg in July 2013. Albert Namatjira Jnr, born 1949, was a grandson of Albert Namatjira. His father was Oscar Namatjira, one of Albert's five sons. 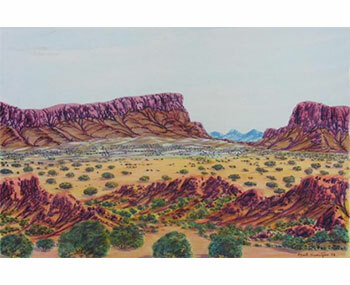 Albert Namatjira Jnr learnt to paint landscapes from his father and uncles, but preferred to paint in pinks and oranges which he regarded as real desert colours. He lived and worked in Adelaide and sent his paintings to Ngurratjuta to exhibit and sell. Kevin Wirri died in Alice Springs after a long illness on or around his 61st birthday. He was buried at Alice Springs in April 2014. Born in 1953 and raised at Haast's Bluff to father Kata Wirri and mother Freda Nangala, Kevin attended school in Papunya and Arreyonga. As a young adult, he returned to Haast's Bluff to work, then went on to Alice Springs to work for the Tangentyere Council. In 1995, he was elected to the Tangentyere Executive and was a member of the 4 Corners Council, a group of traditional lawmen who make rules for Aboriginal people in the Central Australian region. Kevin Wirri was an artist all his life and worked on several large art projects, including the mural at the Docker River store which he designed. 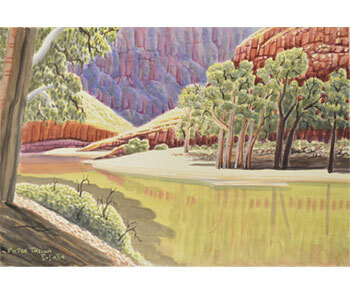 Kevin worked mainly in watercolours and depicts the Central Australian landscape and the West MacDonnell Ranges in his own style, which made him an artist of renown. Art Centre Manager, Iris Bendor, described him as a dedicated friend and fellow artist in his Eulogy. "He painted with us until his last day. On his last day, he painted a draft proposal for a mural in town. We drove together with a group of artists to the Desert Knowledge precinct and I have taken a wrong turn. I remember looking at the back in the mirror and seeing him shaking his head from side to side, as though saying “oh, young people today, hopeless….” After that, we said goodbye and the next day he was no longer with us." One of his sons, Elton Wirri, paints with watercolours in a similar style to his father. Kwementyaye (Peter Tjutjatja) Taylor was involved in a car accident on the Rainbow Valley Road in the Northern Territory and was buried at Alice Springs in November 2014. He was aged 70. Kwementyaye (Peter Tjutjatja) Taylor was born into a large family at Oodnadatta in South Australia in 1944. His father worked as a station hand in the Central Desert region, and as a small boy Peter accompanied his father as he worked at stations from Horse Shoe Bend through to Hermannsburg, 120km west of Alice Springs. It was these early years in Hermannsburg which shaped Peter’s lifelong interest in painting. After completing his schooling in Adelaide Peter returned to live in Alice Springs. He was a valuable teacher to younger generations of artists with Big hART’s Namatjira project. He was a workshop leader at Ntaria School, committed to teaching students to paint and to passing on the stories of country. He also led workshops with Ngurratjuta Many Hands at Alice Springs Desert Park, and at Yirara College, and performed and delivered masterclasses as part of Big hART’s Namatjira theatre show and tour. He also used to teach family and friends watercolour painting at the Todd river including some of the prominent artists we have today. 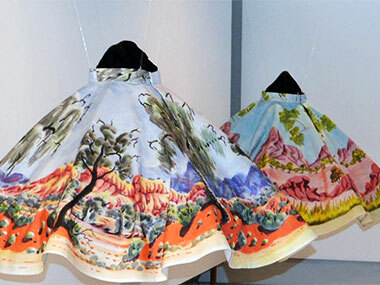 Peter produced two significant circle paintings for The Namatjira Collection but never got to see them come to life as the skirt-sculptures hanging in the gallery space. Douglas Kwarlple Abbott was 61 when he died after a short illness in Alice Springs. He is buried at Alice Springs. Douglas Kwarlple Abbott was born in Hermannsburg in 1954 and spent his childhood near Idracowra on the banks of the Finke River, south of Alice Springs, before moving to Alice Springs with his parents, Gordon and Joyleen Abbott. As a young boy, he learned to paint by watching Albert Namatjira, Clem Abbott and the original Hermannsburg watercolour artists. It was Clem Abbott who advised Douglas to develop his own style, which he did with great success. Galleries which have had exhibitions featuring these artists include RAFT Artspace (Alice Springs), ReDot Fine Art Gallery (Singapore), Paul Johnstone Gallery (Darwin), Metropolis Gallery (Geelong), Alcaston Gallery (Melbourne), Talapi Gallery (Alice Springs) and Tali Gallery (Sydney).